Now, I wonder if you apply this framework to cities? 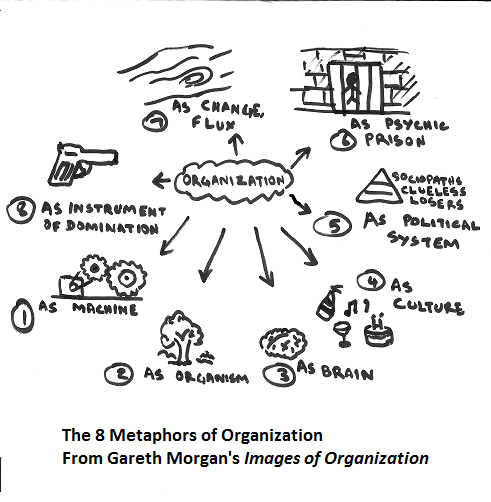 Morgan’s book is based on the premise that almost all our thinking about organizations is based on one or more of eight basic metaphors. The main reason this book is hugely valuable is that 99% of organizational conversations stay exclusively within one metaphor. Worse, most people are permanently stuck in their favorite metaphor and simply cannot understand things said within other metaphors. So these are not really 8 perspectives, but 8 languages. mainstream Michael-Porter view of business is within this metaphor. emphasis from "life processes" to learning. Organization as brain is the source of information-theoretic ways of understanding collectives ("who knows what," how information spreads and informs systems and processes). The System Dynamics people like this a lot, especially Peter Senge (The Fifth Discipline). I cannot recommend the SysDyn approach though; I think it is fundamentally flawed. But the learning view itself is very valuable. More so than others, culturalists tend to be extremists; they think the culture metaphor is the most important one, and this rigidity traps them in peculiar ways. Think of a dynamically stable whirlpool or eddy in a flowing stream, and you get this one. It highlights some of the same aspects of organizations as the Organism metaphor, but in different ways. For example, notions of stability, dissipation, entropy, and other physics ideas are used. This is where things like GTD, lean startups and agile programming fit. The idea of creative destruction also fits in here. If the Machine metaphor is the dominant one, this one is the market-leading alternative metaphor. This is NOT the same as the political metaphor, since it involves naked aggression in some form. This is where you get themes of oppression, sweat-shops, social costs (such as the BP oil spill), the military-industrial complex and so forth.